Using experimental and quasi-experimental tools of causal inference, we rigorously evaluate the impacts of specific investments and interventions. We generate value-for-money estimates for these investments and interventions in different locations and under different conditions. We have particular expertise in geospatial impact evaluations (GIEs), which are often cheaper and faster than randomized control trials because they can be conducted remotely and retrospectively with existing data. They can be used to evaluate individual projects or broader project portfolios, and they open up new possibilities to evaluate long-run (post-program) impacts. In partnership with organizations including USAID, the World Bank, the Global Environment Facility, and the German Development Bank, we have led a wide-ranging global effort to use GIE methods and tools to evaluate the economic, social, environmental, and governance impacts of development. Learn more about our GIE methodology. 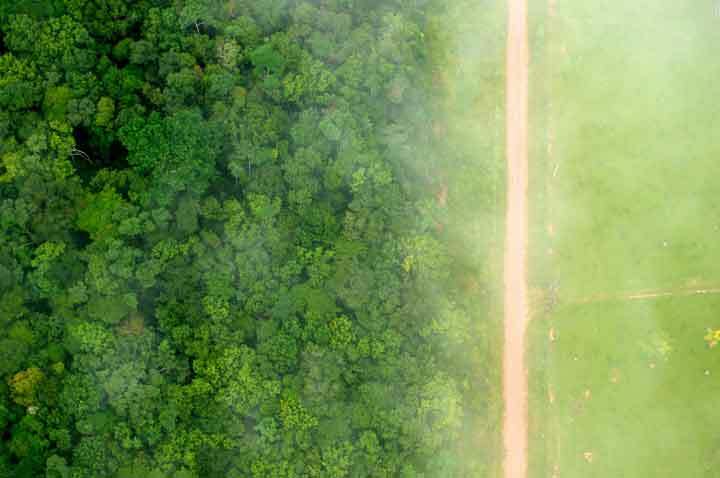 AidData collaborated with the German Development Bank (KFW) on a large-scale evaluation of land rights and enforcement on deforestation rates in the Brazilian Amazon. The collaboration employed 30 years of remotely-sensed landcover outcome data to provide a rigorous estimate of program impact. Between 1995 and 2008 (see image to the left), the project demarcated 106 indigenous lands in the Brazilian Amazon. As part of the collaboration, KfW provided detailed boundaries of community lands, administrative data on the criteria and timing for treatment, and additional project documents. AidData processed high-resolution satellite imagery and employed quasi-experimental matching and panel methods to estimate program impacts on forest cover. We tested the effect of demarcation on deforestation rates using propensity score matching and fixed effect techniques. This research, originally an AidData Working Paper, has now been published in the Journal of Environmental Economics and Management. Our interdisciplinary research team, along with the World Bank’s Independent Evaluation Group (IEG), developed a framework for a value-for-money (VFM) assessment of standing tropical forests. By combining contextual information about the World Bank-funded development projects with (a) data on the costs of historic projects, and (b) existing research on the value of tree coverage in terms of carbon sequestration and biodiversity, we provided an analysis of VFM for historic projects, and a recommended methodology for VFM assessments based on the proposed location(s) of future World Bank projects. The final dataset included 19,940 project locations and our analysis also used relevant covariates and outcome variables at each World Bank project site sourced from datasets with global coverage -- including population, distance to urban areas, nighttime lights, distance to roads and rivers, a variety of environmental characteristics: climate, slope, and elevation as covariates, and in-situ measurements of biodiversity and satellite estimates of vegetation as outcomes.